You can check to see if the developer of an iPhone app has released an update. 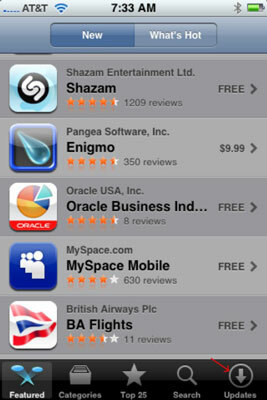 Simply open the iTunes App Store on your iPhone, and tap the Updates icon at the bottom of the screen. Click the Updates icon, located in the bottom-right corner of the screen. If you see (in the middle of the screen) a message that says, “All Apps are Up-to-date,” then none of the apps on your iPhone require an update at this time. If an app needs updating, it appears with an Update button next to it. Tap the button to update the app. If more than one app needs updating, you can update them all at once by tapping the Update All button at the bottom of the screen. Keep in mind that if you try to update an app purchased from another iTunes Store account, you are prompted for that account’s ID and password. If you can’t provide them, you aren’t allowed to download the update.